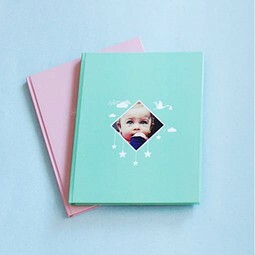 A beautiful photo book with a shiny, soft cover to protect your most precious memories. 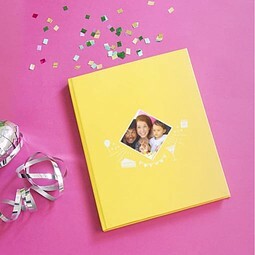 Perfect for collecting your holiday memories, chronicling your child’s firsts, and as a personal gift. 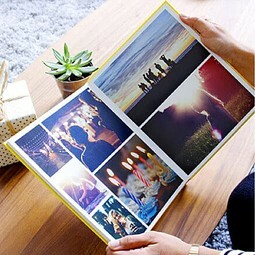 A top of the line photo book with a unique feature; a window in the hard cover gives you a peak of the first photo! Tested and approved by newly weds, dog owners and proud parents alike! With it's elegant hard cover, this beautiful opens completely flat, making sure even large format photos are shown without distortion. Perfect for amazing landscapes, big group photos and wedding photos (fitting the whole famlily without folding aunt Elsa's face!). The Year Book special edition photo book: make the most marvelous moments of the year last for decades to come. A super idea and so cute for a surprise present for my partner. He found it "excellent" and that the quality was excellent too. I really liked the creation process and that I didn't need to ask myself a million questions - well done! It's really easy and I created an album that's A+.. in my opinion ;) Thank you again!!! 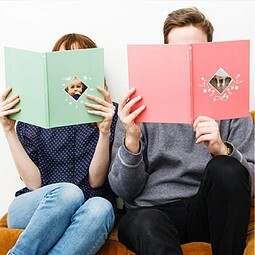 Photo Books with themes, for all occasions!